Industry Commitment - Making time to get involved is a deep commitment. Our honorees are significantly involved in developing people and this industry through committing their time at industry events, associations and work groups. Dedication to Learning - It takes a confident person to admit they don't know everything. Our honorees understand that life is a journey of learning, and have demonstrated their commitment to learning by earning certifications, maintaining memberships and by their continued involvement with industry events. Leadership Qualities - IAI embraces the ancient concept of "servant leadership" and our honorees embody those qualities. One of the most important descriptions of a servant leader is gratitude. In this issue, each honoree describes the individual(s) whom they are grateful for in their career. Career Journey - A career path can be as diverse as the individuals we meet along the way. Our honorees have taken different paths which provides valuable and unique lessons readers can learn from. There is not one "right" career path as our honorees demonstrate, but they share wisdom that has guided them along the way. Which quote will you find most inspiring? 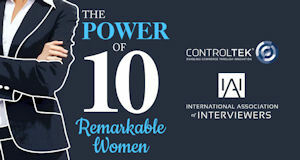 IAI will continue to recognize and honor remarkable women in the industry each year by devoting a special edition of the CFInsider to them as well as maintaining columns in our regular publication and by dedicating space on our Website: certifiedinterviewer.com. Congratulations to this year's Remarkable Women! & Corporate Security, Gap, Inc.